WhyBlog: Have Liverpool been doing good up till now? Have Liverpool been doing good up till now? 13th place, 11matches, 12 points, 2wins, 6 draws and 3 losses. Thats the position Liverpool is in when it comes down to the Premier league. If you just read that off right now, without knowing what happened in each of the matches, you'll probably think that I'm quite mad about these results. Well, the truth is, I'm not happy. But it doesn't mean that I'm angry either. I actually thought that Liverpool would be higher up the table, with no losses in 5 straight matches and with Suarez being at the top scorer. So, why are they so low in the table? The reason's simple. Liverpool never win. Sad, but it is the truth. The only thing thats keeping Brendan Rodger's neck safe is the illusion caused by the draws. It is also possible to find easy reasons for a few of the losses because they were against Man U, who are first in the league right now, Arsenal, the famous club, and West Brom, which is 5th in the table right now. There is another huge factor that deceives fans and players. Liverpool are playing good football. Liverpool, who has been using the old style tactics with strikers like Andy Carroll, are using the new, clever, spanish short passes football. This style makes fans and players have an excuse. "We were playing good football it's just that we were unlucky." Have Liverpool been doing good up till now? No, they have failed to get even over 10th place. 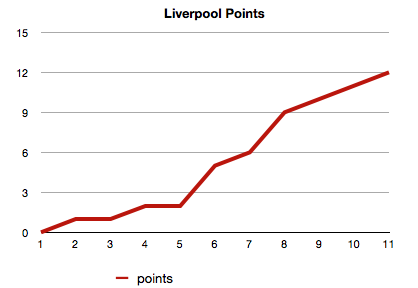 I think that Liverpool have to focus on winning. Not about playing good football or avoiding loss. Suarez have been the single man hauling the luggage. It is time for some action. Drawing twice only gets them 2 points, which losing one then winning will gain them 3. All for one, one for all. To the win.